A monofilament fiber, used for strength. Juno was invisible behind her when the fusion motors fired. Immediately the cable at her tail began to unroll. The cable was thirty miles long and was made of braided Sinclair molecule chain. Trailing at the end was a lead capsule as heavy as the ramrobot itself. Researchers are pretty close with this one. 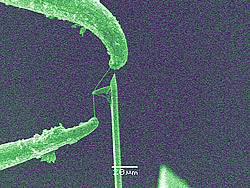 In November of 2006, NIST reported on carbon nanotube "cutlery" - a single carbon nanotube stretched between two tungsten needles. Thanks to an anonymous reader who reminded me about this item.